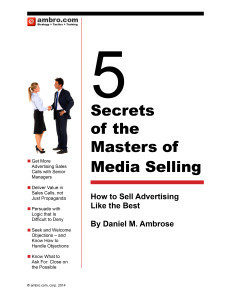 Your media property is the best choice for the prospect but they say the price is too high. Or your price-value relationship is fair but gets a lot of argument. Welcome to advertising sales. This sales-tip is about how to close more, bigger, deals. The bible of persuasion, Robert Cialdini’s “Influence: Science and Practice” tells us that as humans there are 7 principles of what persuade us: “Commitment and Consistency” – logic to us non-academics – is the key one for advertising sales. Commitment and consistency is important in advertising sales because, unlike “Liking,” or “Reciprocation,” logic can be carried, repeated, by a buyer, to an influencer, and visa versa. Plant the seeds for successful selling with Pre-Suasion presentation tactics. 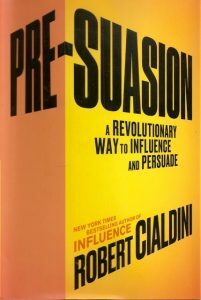 Now Cialdini, in Pre-Suasion; A Revolutionary Way to Influence and Persuade, tell us of a corollary of persuasion theory: we are influenced by what is in our head from the beginning of the persuasion. By establishing a big marketing opportunity in the brains of a prospect at the beginning, establishing Commitment to the market size which is far larger than the deal we are trying to sell, we are “pre-suading” the prospect to accept our proposal at a higher level at a later point in the logical recommendation. When the conversation starts, Cialdini tells us that if we are thinking big, we’ll be more easily influenced to accept a big number. Specifically, if we hear a big number immediately prior to the conversation, we’ll generally accept a higher number that is the subject of the persuasion; the higher value or higher price of what we are being sold. To apply this principle, stick with the persuasion approach we teach in Strategic Sales Tactics: Start with a statement of the size of the advertisers’ market opportunity. This has two advantages: First it is a fact that is easy for prospects to agree to, and second, it’s a big number that gets them thinking big. For instance, if I were selling an ad campaign for a newspaper to a restaurant, I would start by pointing out how big the dining-out market is in their city in dollar terms per year. This is a big number. Then it is easier for the restaurant owner to imagine that their ad campaign will win a small percentage of that large amount of business when I later make a proposal. Every sales persuasion must rely on Commitment and Consistency discussed in Chapter 3 of Cialdinis Influence, now in its 4th edition. That is logic to me and to you. Cialdini tells us we must achieve commitment to the assumptions behind a logical argument for that persuasion to have traction and achieve the goal of changing the mind of a prospect and making a sale. When we start with assumptions about the size of the market opportunity we get our prospect committed to the beginning of the logic, AND we “pre-suade” them with thinking big from the beginning. Start your sales pitch with information about the large size of the clients market opportunity to give yourself a pre-suasive advantage to close the deal.